“@Atlanta_Falcons : END OF 1st QTR: Falcons 10, Saints 0 #ATLvsNO #RiseUp ” ???? #ATL #ATLvsNO THE ATLANTA SECONDARY IS PLAYING!!!! Hb that defense mcclain! #ATLvsNO @Atlanta_Falcons !!! “@SirChiefAl0t : Smokin a blunt gettin ready for this #ATLvsNO season opener.”❗???????????????????????? LOL! 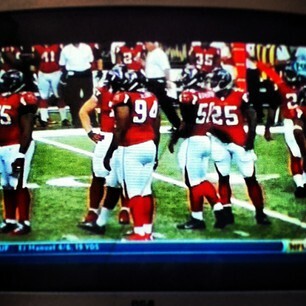 RT @JeffSchultzAJC: #Falcons lead 10-0 after first quarter. That puts them on a 640-0 pace for the season. Alright saints lets win this!!! #WhoDat #ATLvsNO #NOLA #Saints ???????? “@Atlanta_Falcons : END OF 1st QTR: Falcons 10, Saints 0 #ATLvsNO #RiseUp ” ❤??????????? ?